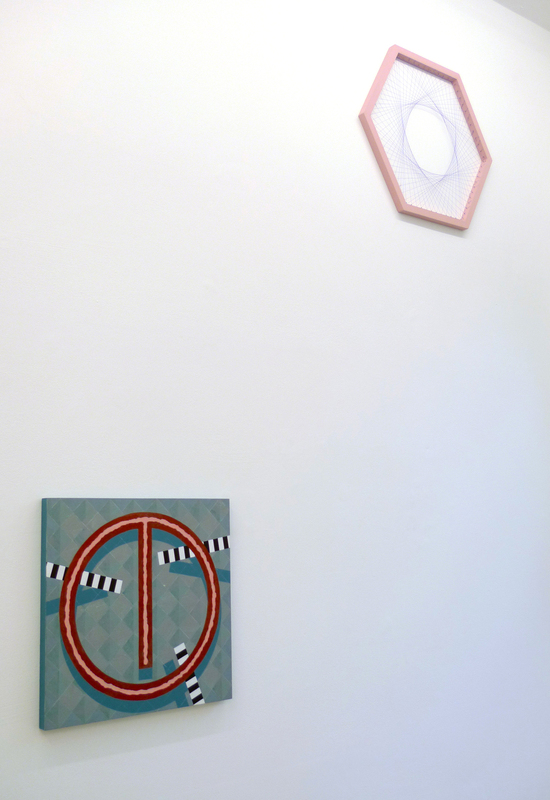 Ben Cove and Kate Terry have been unintentionally collaborating to shape this two-person exhibition, their practices complement each-other so well that one would assume some kind of exchange has taken place, while in reality they worked almost unaware of each-other. Powdery paints and neon-bright lines are the building blocks for both artists: Cove mixes them with a juxtaposition of almost recognisable elements often borrowed from design and architecture, whereas Terry defines delicate geometries with painted wooden structures supported by a system of threads. Kate Terry's practice encompasses sculpture, installation and drawing, exploring the relationships of points, lines, angles, and forms from their defining conditions. She employs utilitarian materials with economy and restraint, often disrupting our perception of depth, and of shapes and structures in space. Terry's sculptural works consider concerns of weight and presence with direct emphasis on their physicality. These geometric abstractions are reduced to succinct lines and planes of colour, and are often physically tethered by Terry to the spaces they occupy; tied by threads or propped, wedged and suspended from walls and corners. After studying Architecture in Nottingham Ben Cove moved to London to study Fine Art at Goldsmiths. He has exhibited nationally and internationally, recently he was selected for the London Open 2015, on show at the Whitechapel Gallery from July to September. Kate Terry studied Fine Art and Sculpture in England and Canada, she is currently an associate lecturer in Fine Art at Camberwell College of Arts and has shown extensively in the UK, Europe, and Qatar.